yours and your competitors′ positions tracking and comprehensible analytics business information. It allows you to build a complete picture of your business situation on the market. This analytical information helps you highlight key points in your future work: fill your site with the content based on the proper keywords, buy/exchange links by the corresponding keywords, etc. 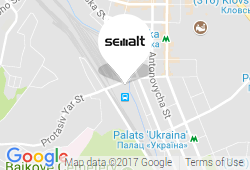 Semalt Analytics will reveal you all details on your rivals’ situation on the market. Using this information effectively will allow you to always excel in proper search engine optimization, promotion and advertising campaigns. The information obtained from your business analysis opens up fresh opportunities for goods and services distribution and your brand development in the specified countries, prompting your business to take into consideration region-related features and etc. It’s hard to overestimate the importance of this task when making presentations for clients and management. You have a unique opportunity to make white label reports and present them to the third party under your brand. Be aware. Start using our website analytics now! We help you select the most relevant commercial keywords. Watching and analyzing your keywords position by time. Tracking your website′s positions on search engine system daily. Research and analysis of your competitors search engine rankings. This analytical information displays your popularity rate, allowing you to develop a competent cooperation policy. Comprehensive analysis of your website′s compliance with the website development and SEO industry requirements. After registration on our website you launch the analytical data gathering process and receive a detailed report on your website’s positions and positions of your rivals as well as your website’s correspondence with website building and SEO industry standards. If you already have an account, you can always add new project (website) in your personal cabinet and it also will be analyzed by the system. During website analysis, our system offers you selling and visitors-generating keywords for your website based on the website’s content and meta name="keywords" data obtained from the website analysis. You can add your own keywords or remove the existing ones at any time. Each country domain zone that enables the online search in your chosen language is supported by 338 Google search engines. All these engines determine your website’s rankings at Semalt. This is why Semalt recommends using several search engines for the website analysis. You can choose up to 5 search engines per one website. Every day we analyze website rankings and keep track of their growth. In addition, we gather information on your rivals (if you choose to watch their websites). Unlike other services we regularly update your positions, thus granting you a unique option to track your website′s positions online at any time of the day, to learn about the latest changes. You are provided with many filters that will make your work with data easier and help you make detailed conclusions on your projects’ success. You also can use API system. There are few ways of information transfer and a module on a third-party resource is the best of them. It is convenient because data get synced automatically, allowing users to see the updated information. No effort on your part is required. You can display constantly updated analytical data on any chosen source. All analytics are presented to you via detailed analytical report converted into PDF of CSV formats (White label & Semalt label) that you can download from the website. The reports can also be sent to the indicated e-mail according to the stated schedule. It is comfortable for your own perception and more suitable for presenting growth dynamics to the third party. Your personal manager is supervising your progress and ready to consult you or answer your questions at any time. You can get in touch with our team at whatever time is convenient for you.